This is a look at a draft of a screenplay, not the film itself. Many things can and often do change between this stage and the final film. Not least, it actually gets shot. Spoilers that might impede your enjoyment of the movie will be avoided but if you want to remain a Paul virgin, look away now. 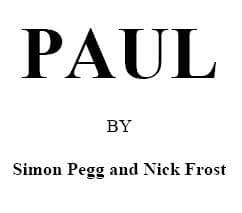 Paul is a movie currently shooting written by and starring Simon Pegg and Nick Frost (Spaced, Shaun of The Dead, Hot Fuzz.) They play Clive and Graham, a couple of amateur comic book creators attending San Diego Comic Con who take their trip as an excuse to go down to New Mexico in an RV and find Area 51. They fail, but they do find an alien named Paul who hitches a ride. Even if he finds them rather embarassing geeks. And I loved it. Absolutely. But how much of my enjoyment of the script is purely from self-identification, I can’t be sure. Thirteen years ago, I was a British amateur comic creator travelling to San Diego with my American co-publisher in his truck. No aliens that I recall, but I did enjoy the positive way people responded to my accent and, basically, thrust themselves upon me. Clive and Graham don’t have quite that luck, instead they thrust themselves upon America. Their road trip takes in Creation Vs Evolution, the bizarreness of alien conspiracies, diner culture, sat nav, lights in toilets, masculinity, and the propensity of irrelevant information. Yeah, I’m totally there with that last one. This script is chock full of gags, bursting at the seams. Comedy of repetition, plenty of pull-back-and-reveals and overflowing pop cultural references including one Back To The Future gag that had me gasping for breath I laughed so hard. 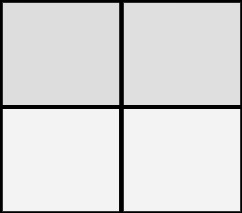 But these references aren’t surface, they are used to describe the relationships that the characters have with each other. Why use words to explain how you feel, when you can just find a common episode of Star Trek that does the job a lot more effectively. It’s honest, it’s true, yes it’s mocking but in a way that both validadates and celebrates both the actual reality and the often unrealised potential of the geek lifestyle. Damn it if the screenplay isn’t moving and poignant in places. But mostly it’s Simon Pegg and Nick Frost revisiting their past screen partnership performances, the friends who know each other so well, forgive the other’s eccentricities as their own are forgiven and would likely die for each other. As long as they were trying to Capture the Flag. No one does bromance like these boys. It’s not surprising that Paul is the character who seems, well, most normal most of the time. The production team plan to film at San Diego this year and will likely use the backdrop of the show to give the film the kind of texture and scale denied the usual mock-con shots used in the likes of Chasing Amy or Entourage. And it’s a show that I’m flying into to cover for this very site. I was a zombie in Shaun Of The Dead. I wonder if I can be a background geek in Paul? Follow Nick Frost on Twitter as he reports from set.